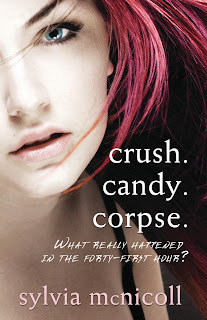 Super Happy Jen's Super Happy Blog: C is for crush. candy. corpse. Yesterday, I blogged about the book launch of crush. candy. corpse. by Sylvia McNicoll, who has written 30 books and birthed three fabulous children (including yours truly). Since today is C-day in the blogging challenge and Mom's book title is so laden with C-words, I will now delight my faithful readers with an unbiased review of the novel. The book is narrated by Sonja Ehret (Sunny), a teenager who volunteers in the Alzheimer's ward at a senior's home and ends up on trial for manslaughter. Each chapter begins in the courtroom and then flashes back to Sunny's school volunteer journal as the events unfold. While I always enjoy my Mom's writing, there are books that stand out from the others, times when Mom just nails it and tells a story that is so real, and says so much. This is one of those books and this is one of those times. My mother's greatest strength is in creating memorable characters, who you can see when you read them. Every nurse, senior, teen, even the most minor of personages has a face and a voice, particularly the Alzheimer's patients. Those of you who know me, and have read this blog, know that my grandmother recently died of Alzheimer's. Over the last few years, Mom spent a great deal of time in Omi's care facility, feeding her yogurt and watching her slip away bit by bit. There is so much of my grandmother's journey in crush. candy. corpse. The book is dedicated to Omi and the story is so personal that Mom named the main character after herself. Ehret is my mother's maiden name and Sonja was a name my grandparents almost chose before settling on Sylvia. This is a story from the heart, one that needed to be told, and it's beautiful. Posted by Super Happy Jen at 11:36 a.m.
That's great book title for C if there ever was one.